Welcome to the most intelligent ad system you have ever met! Newspaper theme brings you 14 predefined ad spots for sections like header, sidebar, inside articles, and some post templates, in smart lists, above footer or as a clickable background. The theme allows you to define up to 5 custom ads and place them in any location inside your pages. To manage the ad, go to Newspaper > Theme Panel > Ads and open the section where you want to insert an ad. Just add your code and save the settings. 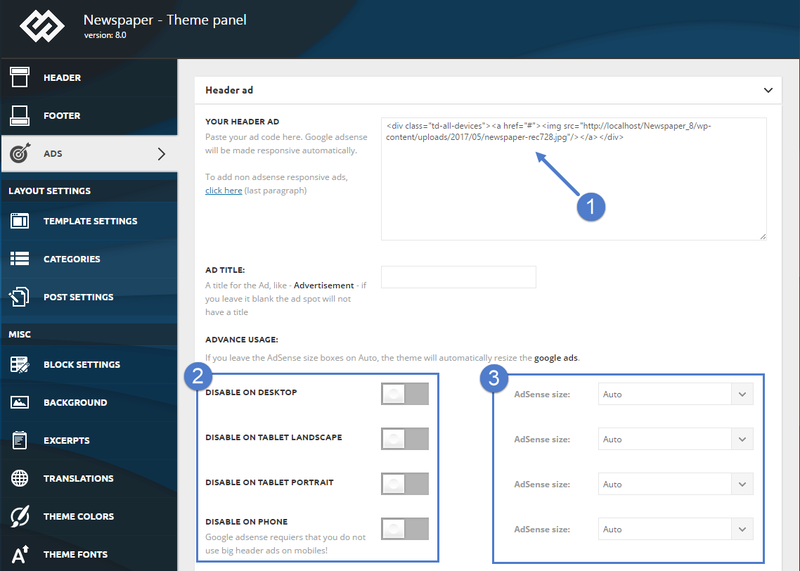 If you use Google AdSense ad code, the theme will automatically make it work on all devices. You can choose if you want to deactivate your ad on different devices. You can and also specify its size or leave it to Auto, and the theme will automatically search the ad in the Google system and display the right size on your ad spot.